I had a chance to go to the horse racing in Takarazuka city on a sunny Sunday. This is the third time to go there as one of the events of the Rotary Club. Usually, I am not interested in gambling including horse racing, but I like the special room here to spend the day. 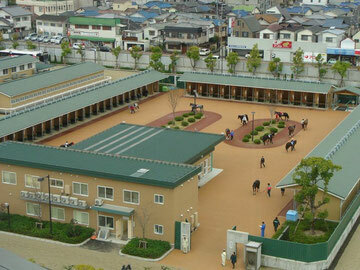 This room is located on the top floor of the building of the horse owners and the view from the room is very nice and the whole track of the races can be seen. We could see the goal and wide screen in front of our building. I bet a small amount of money and had the chance to win several times from twelve races. Betting was confusing because of there are many ways to bet such as betting on horses, on groups, for 2 or 3 horses in order, or regardless of order. I tried several ways of betting by asking someone who knew well enough it. But it was so difficult to get more money than the amount I had bet. Though I lost, I could enjoy the unusual event.